This time we call your attention to a PFS report last week on 66 Minutes, which models itself after the iconic American news magazine 60 Minutes and boasts a Sunday-evening audience of two million viewers. 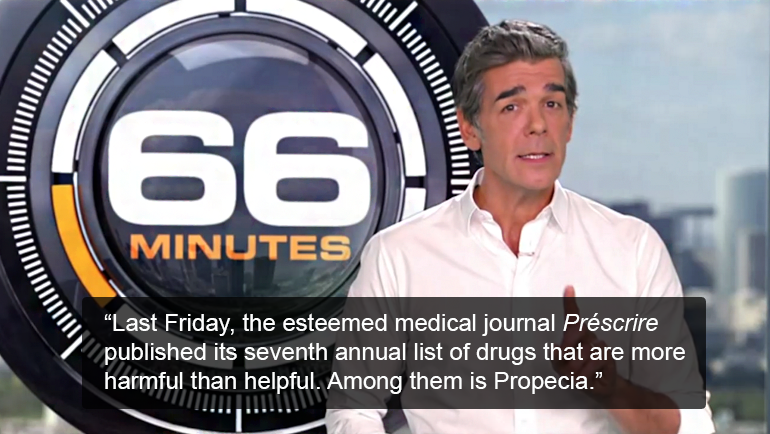 The 14-minute segment, titled Is This Hair-loss Drug Dangerous? (English-subtitled version here), features an interview with François Desgrandchamps, chairman of the Urology Department at Saint-Louis Hospital in Paris. “I think this is a potentially dangerous drug. Twenty percent of men who take Propecia see their sexual function diminish,” he tells producer Paul Gasnier. 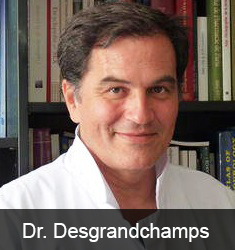 “I even told my brother-in-law to stop taking it,” adds Dr. Desgrandchamps, who's among the PFS Foundation's global team of Medical Professionals offering support to PFS patients. “Last Friday, the esteemed medical journal Préscrire published its seventh annual list of drugs that are more harmful than helpful. 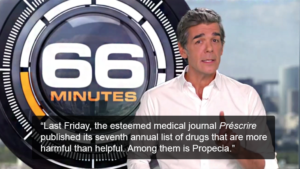 Among them is Propecia,” host Xavier de Moulins reports at the top of the program. And of course, as we recently told you, ANSM dispatched a second finasteride alert (Regulatory Update: France’s FDA-Equivalent Agency Reissues Finasteride Warning) in a letter to more than 100,000 health professionals on Feb. 1 of this year. “We have to tell people, we must cry out, we must do something, we need people to know that this drug can—not in all cases, but in some—drive someone to his death,” says Mathieu.